JEGS Hot Rod Heaters will keep you warm on those cold days, simply connect plumbing and wiring directly to your cooling system for immediate heat. 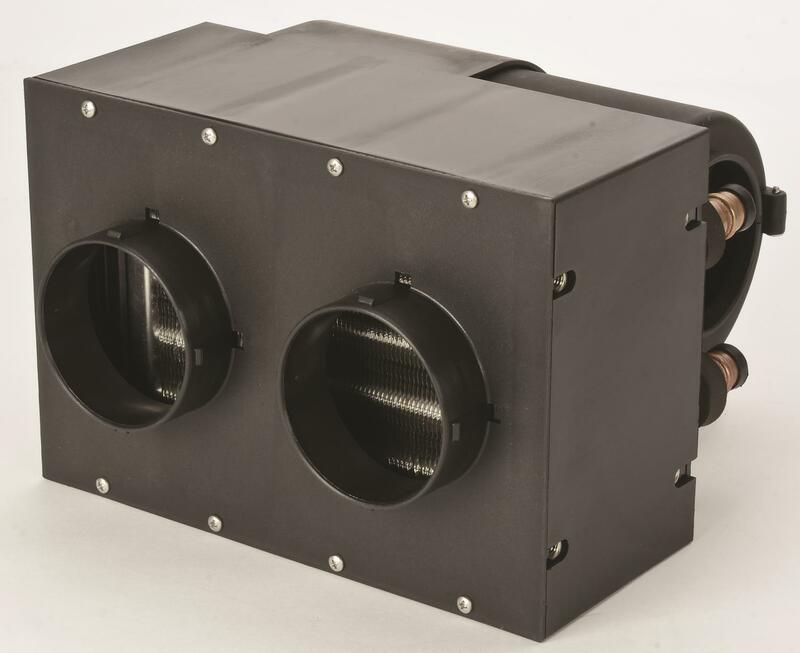 The blower unit blows fresh air through the heat exchanger, elevating the air temperature, which then exits through the outlet louvers adding strong and consistent heat to any vehicle. You can even use these auxiliary heaters as an economical alternative to replacing a worn-out or hard-to-reach heater core. Heaters are available in a variety of sizes and styles with multiple speeds and adjustable settings. Defroster and Louver/Vent kits are available separately. 70601 is rated 4.6 out of 5 by 21. Rated 5 out of 5 by roy57 from Well built, easy to mount Bought for a home-built tractor project. Very impressed with the quality. Comes with nice sturdy mounting brackets, three speed switch and a nice long wiring harness. I was able to mount my heater on the back outside of my cab with only the two three inch round ports entering the cab. In this manner it will only draw outside air which will help keep the windows frost free. Had out this weekend, was several degrees below zero, outlet temp was 150 degrees. Very happy with my purchase. Rated 5 out of 5 by dunatic from great heater I installed this into my rzr 900xp with eps and it fits right in between the eps and the glove box. difficult to mount but not impossible. Lots of air and heat out of this heater. this thing cools the engine in my rzr without the fan kicking on. I need to put some cardboard in front of the radiator to keep it hotter. puts out a ton of air. the only problem is the instructions for the wiring is backwards the med is fine but the low and high are opposite orange is low and yellow is high. after putting the connectors on they are extremely difficult to get off. all in all great choice for a heater. Rated 5 out of 5 by Scrambler from Works great I installed this in my jeep scrambler. Easy installation and gives great heat. Rated 5 out of 5 by Seabee69 from Jegs Hot rod heater. I purchased this for my Atlas 3000 side by side. This heater is amazing, puts out plenty of heat. Drove around the first day with the doors off. I highly recommend this heater, if you like to stay warm. Does this unit come with the electrical harness to run from the switch to the unit? Can this heater be used on a John Deere 1025R tractor (diesel)? I would hook it up to the battery. I have a 40 amp alternator. If you have 12 volt battery power and a water cooled engine than this can be used to supply heat. I live in northern wi and it gets down to below zero throughout the winter. Can this unit be mounted under the hood and piped into the cab or would there be too much heat loss? The unit would be mounted inside and the hot water lines will be used in conjunction with the current heater hoses. I have an ACU-HEAT 300H heater on my 1999 Moomba Outback wakeboard boat that has gone out and I would like to know if your model 555-70601 heater be used on a boat as a good replacement option? They both look identical. Thank you. This is a good heater, it is not marine certified, but has worked in many different applications. Are there replacement heater cores available for these or do I have to purchase a whole new unit? You will need to replace the entire unit, there are no cores available separately. Can this heater operate using water rather than coolant for a marine application? Yes, you can run water through this cooler, we do not recommend salt water. Can you get directional vent covers for this heater? Can you tell me the weight of the 70601 JEGS heater?